Free copy for Cytometrics Website visitors. Harris AG, Sinitsina I, Messmer K, "Validation of OPS imaging for microvascular measurements during isovolumic hemodilution and low hematocrits," Am J Physiol Heart Circ Physiol. 2002 Apr 282(4):H1502-9. Biberthaler P, Langer S, "Comparison of the New OPS Imaging Technique with Intravital Microscopy: Analysis of the Colon Microcirculation," Eur Surg Res. 2002 Jan-Apr 34(1--2):124-8. Genzel-Boroviczeny O, Strotgen J, Harris AG, Messmer K, Christ F, "Orthogonal polarization spectral imaging (OPS): a novel method to measure the microcirculation in term and preterm infants transcutaneously," Pediatr Res. 2002 Mar 51(3):386-91. Biberthaler P, Langer S, Luchting B, Khandoga A, Messmer K, "In vivo assessment of colon microcirculation: comparison of the new OPS imaging technique with intravital microscopy," Eur J Med Res. 2001 Dec 17 6(12):525-34. Vollebregt KC, Boer K, Mathura KR, de Graaff JC, Ubbink DT, Ince C, "Impaired vascular function in women with pre-eclampsia observed with orthogonal polarisation spectral imaging," BJOG. 2001 Nov 108(11):1148-53. Langer S, Biberthaler P, Harris AG, Steinau HU, Messmer K, "In vivo monitoring of microvessels in skin flaps: introduction of a novel technique," Microsurgery. 2001 21(7):317-24. Sofola IO, Pazos GA, Buttolph TB, Casler JD, Leonard DW, "The Cytoscan model E-II in intraoperative parathyroid gland identification in a rabbit model," Otolaryngol Head Neck Surg. 2001 Dec 125(6):635-9. Thomale UW, Schaser KD, Unterberg AW, Stover JF, "Visualization of rat pial microcirculation using the novel orthogonal polarized spectral (OPS) imaging after brain injury," J Neurosci Methods. 2001 Jul 15 108(1):85-90. Boros M, "[Methods for in vivo investigation of human microcirculation]" Orv Hetil. 2001 May 27 142(21):1111-4. Hungarian. De Backer D, Dubois MJ, "Assessment of the microcirculatory flow in patients in the intensive care unit," Curr Opin Crit Care. 2001 Jun 7(3):200-3. Review. Langer S, Hatz R, Harris AG, Hernandez-Richter T, Maiwald G, Messmer K, "Assessing the microcirculation in a burn wound by use of OPS imaging, ' Eur J Med Res. 2001 Jun 28 6(6):231-4. Mathura KR, Vollebregt KC, Boer K, De Graaff JC, Ubbink DT, Ince C, "Comparison of OPS imaging and conventional capillary microscopy to study the human microcirculation," J Appl Physiol. 2001 Jul 91(1):74-8. Tugtekin IF, Radermacher P, Theisen M, Matejovic M, Stehr A, Ploner F, Matura K, Ince C, Georgieff M, Trager K, "Increased ileal-mucosal-arterial PCO2 gap is associated with impaired villus microcirculation in endotoxic pigs," Intensive Care Med. 2001 Apr 27(4):757-66. Langer S, Harris AG, Biberthaler P, von Dobschuetz E, Messmer K, "Orthogonal polarization spectral imaging as a tool for the assessment of hepatic microcirculation: a validation study," Transplantation. 2001 May 15 71(9):1249-56. Nadeau RG, Groner W, "The role of a new noninvasive imaging technology in the diagnosis of anemia," J Nutr. 2001 May 131(5):1610S-4S. Harris AG, Sinitsina I, Messmer K, "The Cytoscan Model E-II, a new reflectance microscope for intravital microscopy: comparison with the standard fluorescence Method," J Vasc Res. 2000 Nov-Dec 37(6):469-76. Menger MD, Vollmar B, "Role of microcirculation in transplantation," Microcirculation. 2000 Oct 7(5):291-306. Review. Groner W, Winkelman JW, Harris AG, Ince C, Bouma GJ, Messmer K, Nadeau RG, "Orthogonal polarization spectral imaging: a new method for study of the microcirculation," Nat Med. 1999 Oct 5(10):1209-12. Gaughan, R. (2000) Bloodless blood counts, in a matter of seconds. Biophotonics International, 7:4, 26. Groner, W., J. W. Winkelman, A. G. Harris, C. Ince, G. J. Bouma, K. Messmer and R. G. Nadeau. 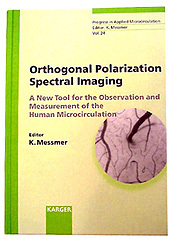 (1999) Orthogonal polarization spectral imaging: A new method for the study of the microcirculation. Nature Medicine 5: 6-10. Harris, A. G., S. Langer and K. Messmer. (2000) The study of the microcirculation using orthogonal polarization spectral imaging. In Yearbook of Intensive Care and Emergency Medicine 2000, Editor J.-L. Vincent, Springer-Verlag, Berlin, pp 705-14. Harris, A. G., S. Pahernik, I. Sinitsina, S. Langer and K. Messmer. (2000) Results from OPS validation experiments. Shock, 13 (Suppl. 1): 65. (Abstract). Harris, A. G., S. Pahernik, I. Sinitsina and K. Messmer. (2000) Validation of OPS imaging. 21st European Conference on Microcirculation. Editor: B. Fagrell. Bologna: Monduzzi Editore, pp. 43-48. Harris, A. G., I. Sinitsina and K. Messmer. (2000) Validation of the CYTOSCAN A/R for intravital measurements in the microcirculation of the hamster dorsal skinfold chamber. FASEB J. 14: A16. (Abstract). Harris, A. G., I. Sinitsina and K. Messmer. (2000) Validation of OPS imaging for microvascular measurements in the hamster dorsal skinfold chamber. Pfl�gers Arch. 439 (6, Suppl.) : R385. (Abstract). Harris, A. G., I. Sinitsina and K. Messmer. (1999) Validation of the orthogonal polarization spectral (OPS) imaging system for intravital measurements in the microcirculation. Anesthesiology 91 (Suppl. 1): A641 (Abstract). Langer, S., A. G. Harris, P. Biberthaler, F. Krombach and K. Messmer. (2000) Validation of the OPS imaging technique in the rat liver. Langenbecks Arch.Chir. Suppl. Kongressbd. 117: 309-312. Nadeau, R. G. (2000) The Technique of Orthogonal Polarization Spectral (OPS) Imaging. Shock, 13 (Suppl. 1): 65. (Abstract). Siegemund, M., J. van Bommel, C. Ince. (1999) Assessment of regional tissue oxygenation. Intensive Care Med, 25: 1044-1060. Uehling, M. Under the skin: sorting through the hype and hope for noninvasive POC devices (2000) CAP Today, 14.7: 52-68. Uhl, E., Lehmberg, J., Steiger, H. J., Messmer, K. (2000) OPS In Neurosurgery. Shock, 13 (Suppl. 1): 65. (Abstract).